Something jolted my awareness two weeks before my 44th birthday. I am generally not affected by aging (that much). Other than denying my eyes are weakening and I have more grey hair than I’ll ever allow to be revealed publicly. I honestly enjoy the stages of aging and the wisdom that comes from it. A couple weeks ago, I had a test done that revealed my sympathetic nervous system isn’t turning off. Basically that means that my nervous system has been operating in fight or flight continuously. I was completely surprised. After hearing the results, I did a great job of defending myself. As I began processing the implications of this, I started to connect the dots. From as young as I can remember, life experiences have taught me to ignore or dismiss my own needs and keep going. I trained myself to treat symptoms then change my overall awareness to improve my ability to recognize warning signs sooner. I’m very proactive after the fact. Before a polarity session I explained all of this to my massage therapist, she replied, “Oh, look! A lion is attacking me but I have to keep moving forward.” Yep…pretty much. Over the past two weeks, I have met with my nutritional therapist, chiropractor and bodyworker recounting more and more realizations that confirm the results of this test. I feel extremely fortunate that this has been identified early, before a serious condition or disorder developed. I have jumped into action to give my body as many opportunities to go into a parasympathetic state. Our whole neighborhood smells like Nag Champa and you can smell the essential oils on me from 50 feet away. For those of us doing our best to raise humans that other humans want to be around there are endless personal and professional sacrifices that come with this job. We really have a short window of time to attempt to be successful in this endeavor. Believe me, it doesn’t feel like it when I’m in the throws of childrearing! Putting myself first is a double edge sword as a woman and a mother. My primal instincts are to nurture. I get a lot of joy from being in service to those I love. Whether that’s cooking, gardening, organizing the garage or volunteering. Acts of service is my love language. Which is probably one of the reasons I love being a mother. At the same time, society reinforces the idea mother’s who do put their needs above their children are selfish, detached or uncaring. It’s an emotional pinball game. I am also the parent of a transgender daughter named Stella. This particular job comes with a different set of challenges. First of all, I am the first line of defense for our child. Picture a bomb sniffing dog. It’s job is to detect danger or possible threats. In a crass way, that’s what I do. I’m determining what people and environments are safe for my kid. In the past six years, I have been hyper-vigilant. I did all the research, attended the conferences and read all the books I could find. I even started publicly advocating for gender diverse children. After sharing what I learned with my husband, we applied it with our child. We continue to be a visual family for those who cannot. One of the prices is having to continually defend, explain or justify our actions and our child to others, even if well intended. All of that on top of the duties of parenting. You know, teaching basic life skills and personal accountability. Anyone else exhausted just reading this? I am proud of my family and would not change anything. Being the parent of a child who defies everything I knew about the make-up of an individual has been extraordinarily rewarding. I see the world so much more beautifully through my child. Beauty has a way of casting a shadow on ugly aspects surrounding. For any parent who is continually advocating for their child it is critical that we take care of ourselves, too. If we don’t who will? Making self-care a priority provides children examples of how and why it’s important. Personally, I’m using this as an opportunity to course correct before my body forces me to. Whether you are just beginning your journey with your transgender (or gender diverse) child or have years racked up; here is a check list to revisit from time to time. 1. Surround yourself with allies, not only for your child but for you as well. Make sure your village is filled with people who love, support and stand by your side, whether you’re there or not. I call it creating our #familyofchoice. 2. Find a parent support group, in person or online. 3. Do not focus on the future. Be present with what your child is coping with now. Focusing on the future draws your attention to all the “what if’s?” that leads to more stress and anxiety. 4. It is not up to you to change the world for all transgender people. This is a collective effort that will have long term ripple effects. The value of raising a resilient transgender human is immeasurable. 5. Take time to unplug from the proverbial Matrix. Keeping up with every news story and/or research article is exhausting and unrealistic. Go out and experience life. 6. Fill yourself up. Find activities and practices that bring you joy, peace and vitality. Life is very draining without these qualities and extremely taxing on relationships. 7. Be vulnerable with your child. Confide in your kid when you don’t know the answer or are scared. Children need to know that being adult doesn’t come with magic fairy dust. Share your concerns or challenges. Ask them what they think or what would they do in your position? Don’t underestimate the capacity of a child’s ability to problem solve. Give them a chance. I guarantee, you will not be disappointed. 8. Maintain your own identity. The last one is for every parent. Just the act of becoming a parent alters your identity, particularly for mothers. A dear friend frequently keeps me in check by reminding me she wants to hear about ME; not my child, nonprofit or advocacy work. This one is a particularly challenging for me, to be honest. Most of my daily activities revolve around my child in one form or another. Fortunately, Stella’s preadolescent stage is forcing me to acknowledge the increasing drive for independence. Create a habit of doing something every day to take care of you. 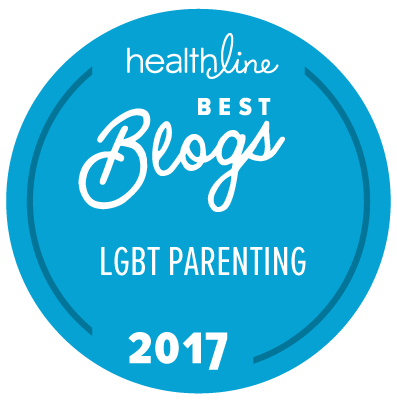 Raising a child that identifies within the LGBTQ spectrum has unique challenges that can trigger fight or flight reactions repeatedly. Our individual identities get over shadowed. We become consumed with what to do, finding resources and services. Many of us have lost family members, marriages, jobs or communities for standing up for our children. As primary caregivers, our wellbeing is equally as important.